Could OLLO be the new LEGO? After all, we’re pretty much used to everything being in motion, where static building sets that require this thing called imagination from our kids might actually be out of vogue if the OLLO Action Kit is in vogue. The driving force behind the OLLO action kit is its motor, and it really depends on your imagination on what you are able to churn out. Other building kits use motors, so what makes OLLO unique? you may be wondering. The difference is how OLLO pieces attach to one another. They attach with an innovative two-part rivet (one goes into the other and presses down to lock the pieces in place). And of course you can always undo the rivets (tool included) to build new and wilder things. 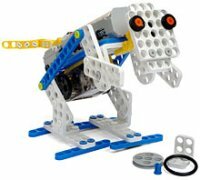 The OLLO Action Kit is perfect for getting young minds interested in mechanics and building. OLLO is so much fun to work with, you might just have to buy two: one for the kids…and one for you! Interested? They’ll set you back by $29.99 per set.